Israel's air force attacked Gaza early on Monday following a rocket attack on southern Israel which the Israeli military pinned on Hamas. Israeli jets hit targets in the Gaza Strip on Monday, following rocket attacks on southern Israel that have been attributed to Hamas. Rockets were fired into Israel late on Sunday night, prompting an attack on the Gaza Strip several hours later by Israeli F-16 jets. Israeli-Palestinian tensions have escalated in recent days, with Palestinian knife attacks against Israeli soldiers. "Yesterday, October 4, a rocket shot from Gaza exploded in southern Israel. In response to the attack, the Israeli air force struck Hamas terrorist infrastructure sites in the northern Gaza Strip," the Israeli military press service said. The jets struck sites allegedly belonging to Hamas' military wing, the al-Qassam Brigades. According to Haaretz, the facility was severely damaged but no injuries were reported. According to the Israeli military, Palestinian groups have launched 16 rockets into Israel since the last ceasefire began in August 2014. During the 2014 Israeli-Palestinian conflict, Israel destroyed clandestine tunnels built by Hamas. The group's tunnel-building activities have also been used in Syria, where Hamas is allied with Islamist forces fighting against President Bashar al-Assad's government and assisted in underground tunnel construction, similar to that now being targeted by the Russian Aerospace Forces in airstrikes. Israeli Prime Minister Benjamin Netanyahu previously said that he has ordered strict measures aimed to prevent acts of terror and restrain and punish terrorists, pledging a "harsh offensive on Palestinian Islamic terror." 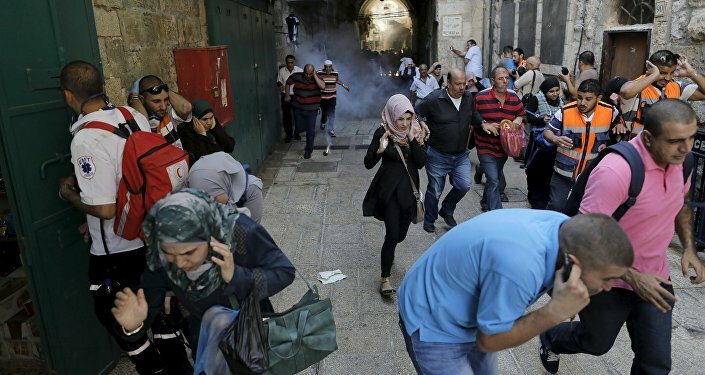 The country's Intelligence Minister Israel Katz previously said that new military operations would begin after four people were killed in attacks in Jerusalem. The knife attacks came after the Israeli government introduced a mandatory minimum sentence for stone throwers.